A mask that has been specifically designed for free diving, but which has characteristics that make it perfect for use when scuba diving too. With this design the aim was to achieve an exceptionally low internal volume by maintaining a very low lens-eye distance. Thanks also to the special raking of the lenses (patented), these characteristics have allowed for the widest field of vision of the entire range of Cressi masks. Despite these exclusive features, the new skirt, in hypoallergenic silicone, is suitable for a large number of facial profiles. The special double injection moulding process of the mask body allows for a structure that is extremely light in composite materials. The buckles on the strap tilt vertically and sideways and are instantly micrometrically adjustable. They are attached to the skirt with an elastic element that offers the buckles an extraordinary range of lateral movement. The position of the strap is, as a consequence, completely natural and does not deform the skirt of the mask in any way. The buckles are also completely indestructible, even when completely flattened. 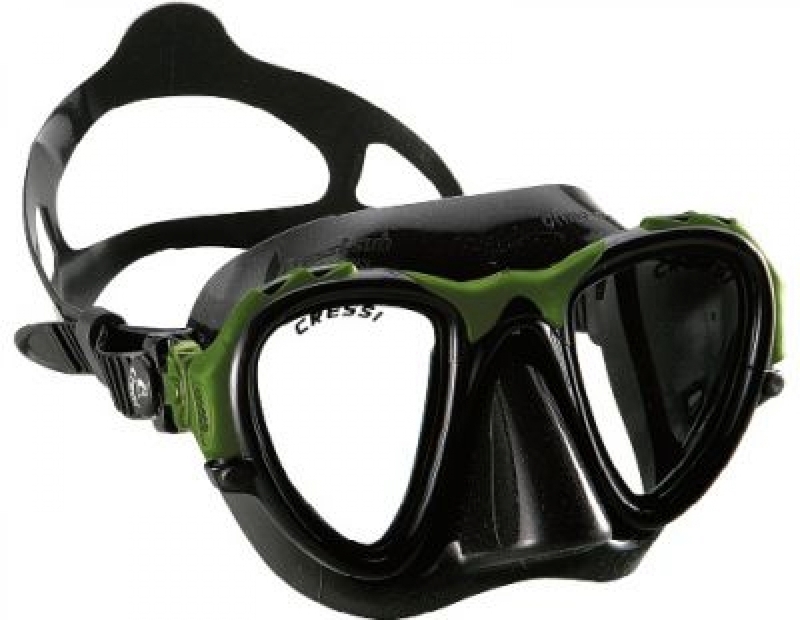 The minimum internal volume makes this mask ideal for deep free diving, spear fishing and for more demanding descents, but can also be used for scuba diving or even as a spare mask, thanks to the sideways tilting of the buckles and the limited space that it takes up once stowed in a jacket pocket.